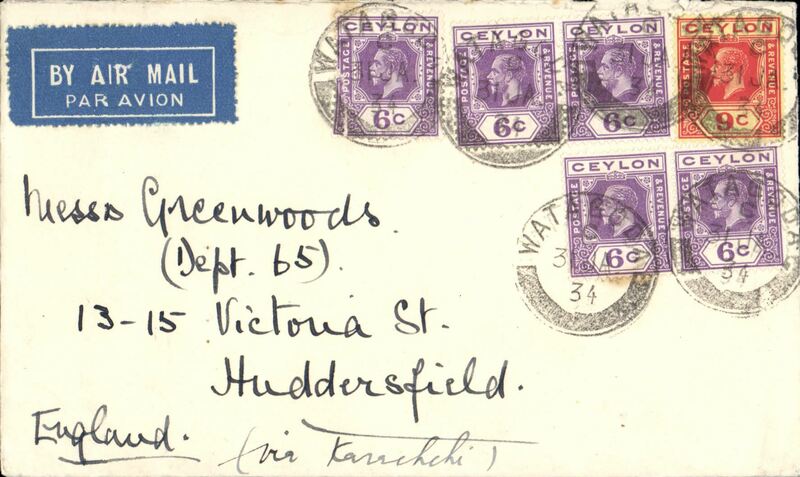 Ceylon acceptance for England via new TATA Madras-Karachi service, Colombo to London, 26/10 Sutton Coldfield arrival ds on front, franked 69c, dark blue/white etiquette, plain cover, Imperial AW/TATA. Francis Field authentication hs verso. Scarce. 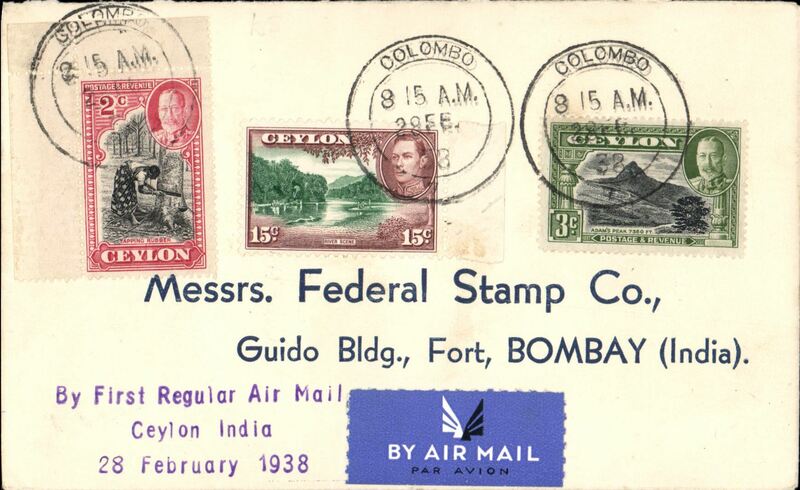 Early airmail, Ceylon to London, franked 39c canc Watuga cds, ms 'via Karachi'. 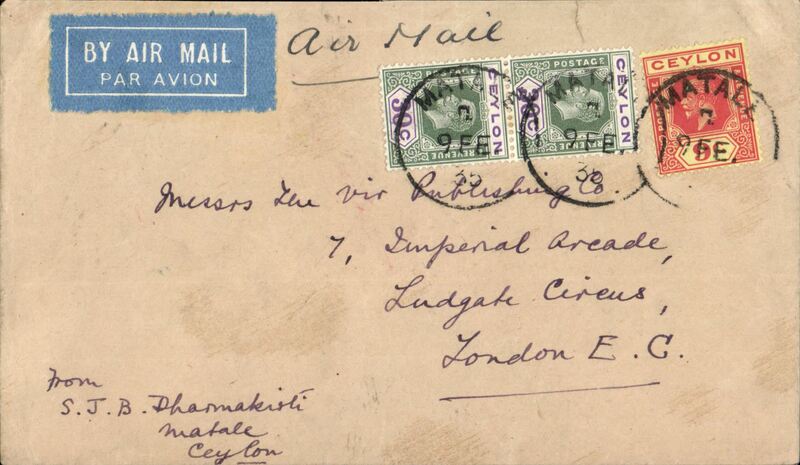 Matale, 150 km from Colombo, to London, airmail etiquette cover franked 69c, canc Matale cds, ms 'Air Mail'. 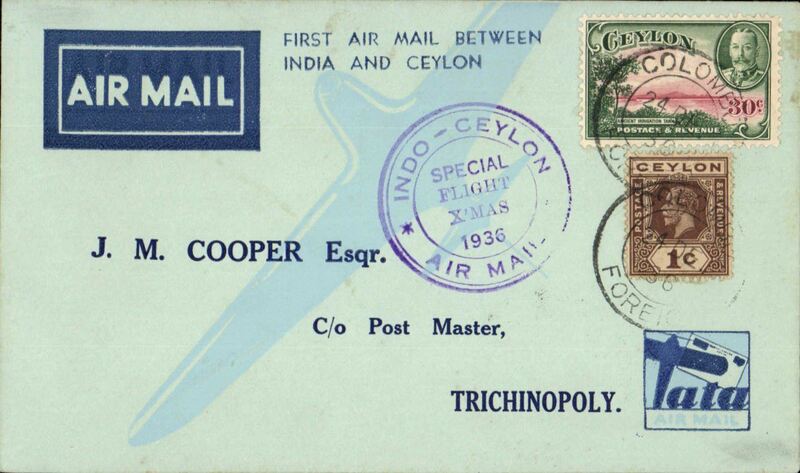 TATA special Christmas flight, Colombo-Trichinopoly, bs 24/12, purple circular cachet, b/s, blue/pale blue TATA souvenir "map" cover. 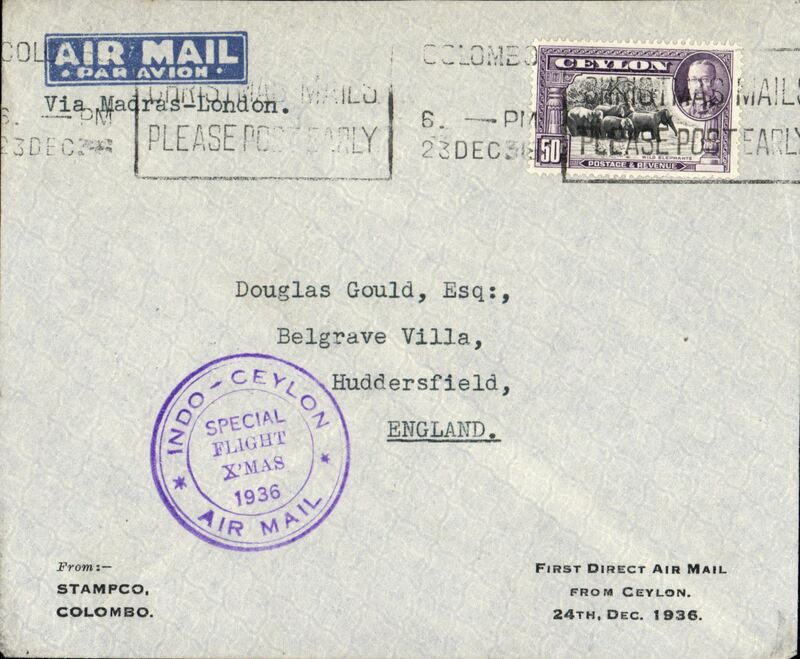 Special Christmas flight, Colombo to Madras and on to London, bs Huddersfield 2 Jan 1937, special flight cachet, imprint etiquette corner cover printed ' FIrst Direct Air Mail/From Ceylon/24th Dec 1936'. 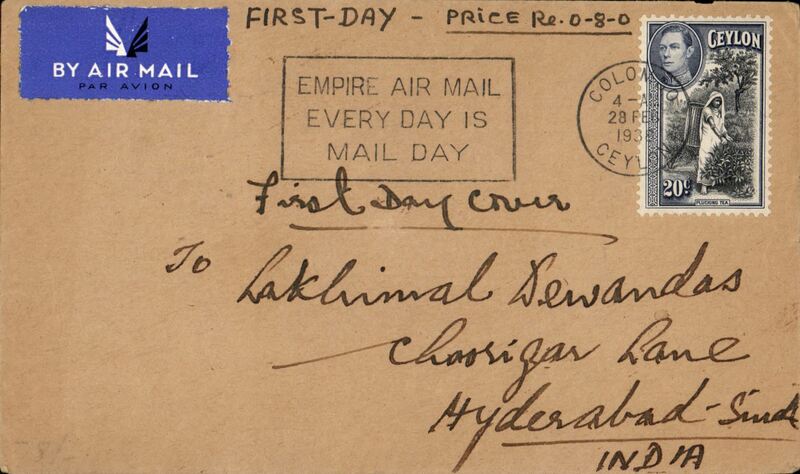 F/F second stage of the Empire Airmail Service, Colombo to Hyderabad, bs 2/3, airmail etiquette cover franked 20c, black framed "Empire Air Mail/Every Day Is/Mail Day" slogan advertising the EAMS. 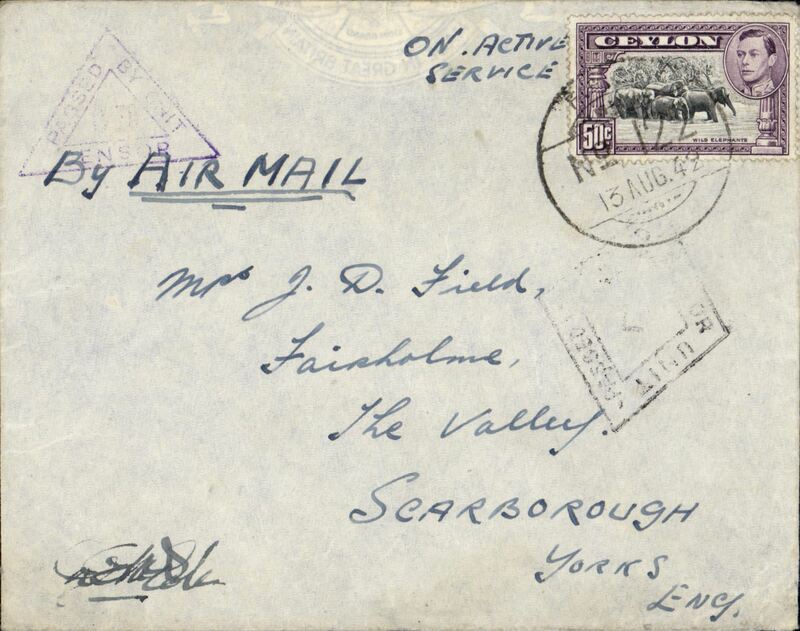 F/F second stage of the Empire Airmail Service, Ceylon to India, Colombo to Bombay, bs 1/3, airmail etiquette cover franked 20c, violet three line "By First Air Mail/Ceylon India/28 February 1938". Early post WWII BOAC personal test letter, cover from Imperial Airways HQ, Colombo, addressed to BOAC, London, company clock arrival dated Feb 21 Feb 1946, franked 1R, typed endorsement "Air Mail/Personal Test Letter", purple Qantas Empire Airways "Approved for Dispatch" cachet verso, official company envelope with Imperial AW logo on flap. 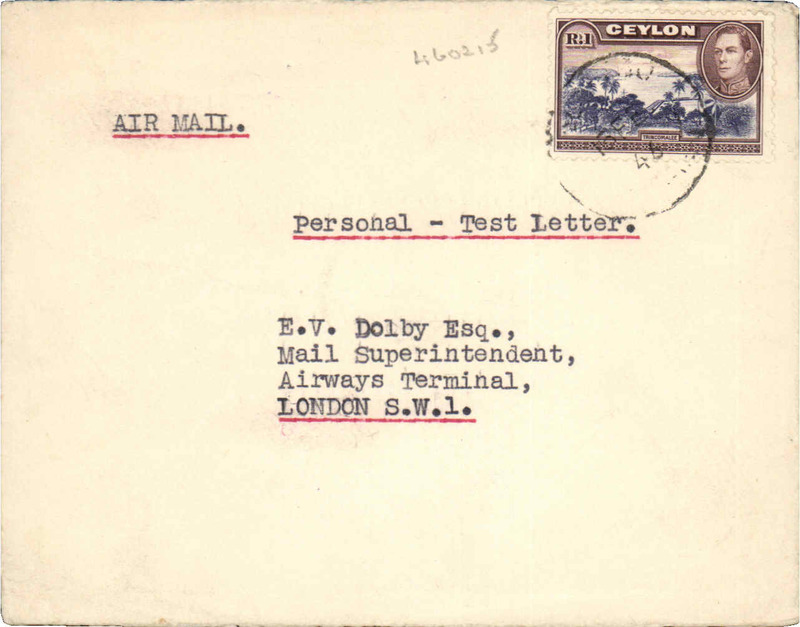 The early post war period saw many changes in the services from India-England (see Stroud 199-220), and test letters such as this were used to monitor the impact of these changes on the airmail service. Nice item.